Here are your highlights for the penultimate weekly livecast of the Project Gooseberry Cosmos Laundromat pilot production. The animations and sims are almost finalized and the final renders are in the making. Plus, there’s a new and improved edit of the film with early sound editing and lots and lots of renders added. Check it all out below and on the Cloud! This week saw three guests in the studio: Sandra, a scene designer from Germany and Andy’s better half; regular guest Martijn Berger; and Erik van Schaaik, a prolific Dutch TV-/filmmaker with a huge resumé under his belt — including (stop-motion) animation shorts and feature films as well. There is a new version of the film in Mathieu’s weekly folder on the Cloud! Almost all scenes are now rendered to some degree: low-res, high-res, or as a preview. Now there is also sound editing for the first 5 minutes — hear Franck’s hooves hit the rock, the branch scrape across the grass, etc. This sound isn’t properly mixed yet, though, so expect a more refined balance to come. 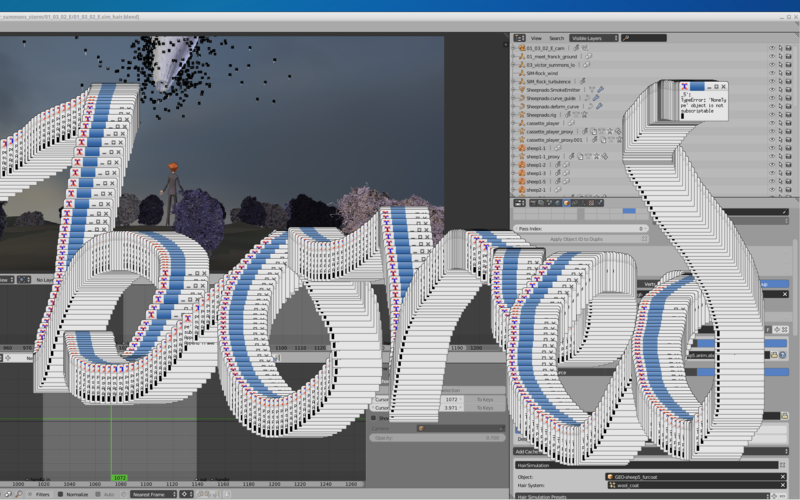 Next to this, Mathieu focused this week on lighting the tornado scene plus shader and motion-blur tests. This shot shows Franck without the surrounding tornado. You can find 20 more of Mathieu’s test shots (most with the tornado) also in his weekly Cloud folder. They are almost final, but the lighting still needs to be refined in some to reflect more the colors of the tornado. Sarah has continued working on the second jungle shot this week. Last week you saw it in blocking, but now it is splined and much more advanced. 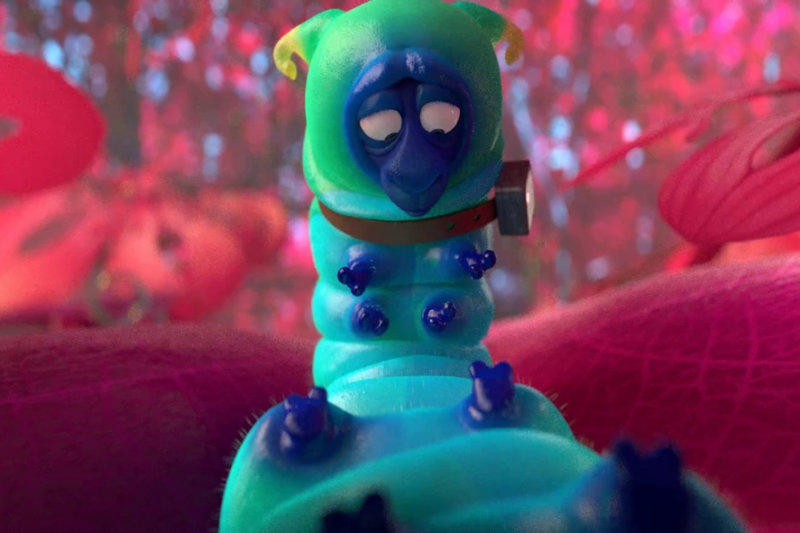 Plus there is reference material of Sarah playing a caterpillar. You’ll find it all in her weekly Cloud folder. 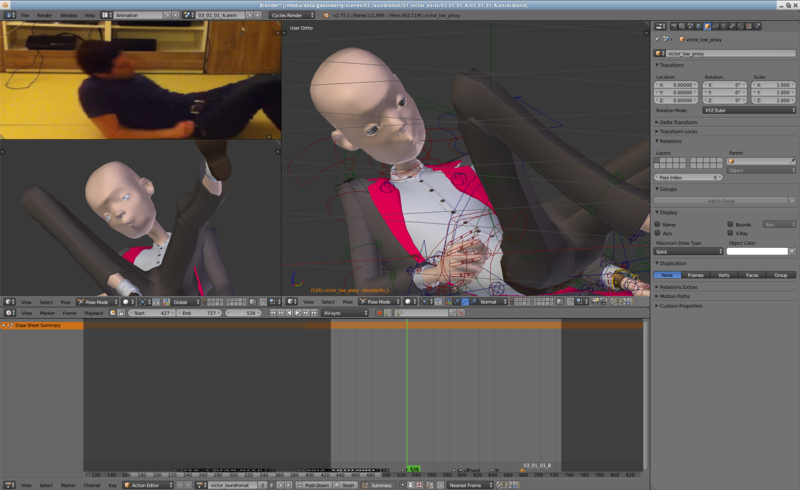 This jacket tweaking was part of Hjalti’s ongoing work on the laundromat animation. [SPOILER ALERT] You’ll notice Victor now emerges from the washing machine wearing the headphones he put on on the island…adding continuity, but also a little extra complexity, to this sequence. Check out the latest version, plus an alternative version from another angle, in Hjalti’s Cloud folder for the weekly. And guess what? Hjalti added a pocket! Since it’s too late to update the rig (see the Alien Victor image above), Hjalti created a patch of cloth with a rig and added it frame by frame to the animation. You’ll find this animation on the Cloud as well. Andy is still deep into the smoke simulations for the tornado, trying to make the interaction between the washing machine drum and the sky more believable, get the colors and swirls right, etc. He also spent a lot of time on the scene where Franck is picked up by the tornado, making sure the storm “chases” Franck and picks him up convincingly and make sure it looks like a vortex tube when you look up. Andy has also continued his quest to get the grass to move realistically in the wind. Did we mention that this caching/sim stuff completely takes over/freezes up your computer? Manu’s second-ever fur sim can also be found in his weekly Cloud folder. With his now increased experience, Manu has updated his caching how-to doc, and you can find the updated version in this folder as well as a comparison of the changes. Manu has now rendered a couple of the animated shots he was working on in super-high quality. You know where to find these sweet almost-final shots: in his weekly Cloud folder. See more final frames from the opening shot the film, with and without motion blur, in Pablo’s weekly Cloud folder. In Pablo’s folder you’ll also find new renders of caterpillar Franck with new UVs and shaders, etc. After adding these, he then fixed the geometry manually, fixed and cleaned the files, making sure they were named correctly, and more. In his folder your’ll even find a WIP animated render of Franck (with bubbles!) not seen in the weekly livecast. Sergey is still working on the mysterious “Project X”, when not putting out fires (NOT literal ones) in the renderfarm, working on release targets, etc. Watch this blog for more on this soon. Antonis solved an editing problem for Mathieu, who likes to edit by cutting strips into many little pieces and wanted a way to edit the color balance of one strip and then apply the changes to the rest of the strips in a sequence. Now there is a button in the UI: Copy to Selected Strips. See Antony’s demo at 40:34 in the weekly video. This has already been added to the Master build. Antonis has also been working more on the Viewport, working on the speed and testing it with the Draw Timer tool. Optimized for quads (like cars), Antony’s new code even speeds things up for triangles. It works especially well for wireframes. This is a WIP, but you can see a demo of the work so far at 42:32 in the weekly vid. By next week, this will all be in the Master build. Antonis wrote about this in more detail in a new blog post on code.blender.org. Pablo and Francesco have, of course, been working a lot on the render farm, trying to maximize performance and minimize renders times, in both Amsterdam and Paris. More final renders coming your way! 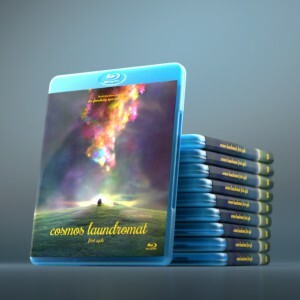 See you on Friday for the last weekly livecast of the Cosmos Laundromat pilot production! Ahhrg! This project X teasing ! The suspense is unbearable .. /me passes out. Coming along great! Now i totally start feeling the vibe of it! Couldn’t Hjalti use vertex parent or hooks to add the pocket? Just watched the last edit of the film. I got goosebumps! (or “gooseberrybumps” if you wish) It leaves the viewer wanting for more. Hopefully it will find its way to becoming a feature film. Thanks a lot, that’s exactly what we’re after ! I hope you’ll be pleased with the final thing ! Just watched the full edit for the first time, its paced brilliantly, leaves you with many questions making you want to know more. When then music kicks in with the tornado, perfect! Thank you very much Jonathan ! It means a lot !! Now that this is the penultimate weekly update, what’s going to happen in July when it’s all rendering? I guess the names on the credits are not final yet, right? The new edit is so amazing! I can’t wait for the joy it will bring in HD with mastered sound and grading etc. No, these were placeholder credits from Tears of Steel! So don’t worry if your name’s not there and it should be…it will be in the actual release!